Update March 7, 2016: National encore broadcast is Friday, March 25, 2016 at 10/9c(check local Schedule). If you were listening to music and watching “The Ed Sullivan Show” in the 1960s, there’s little chance you don’t know the beats and hooks of The Dave Clark Five. Songs like “Glad All Over,” “Bits and Pieces,” and “Do You Love Me?” helped the band sell more than 100 million records in their eight-year run. Here are fast facts for those discovering this British Invasion band for the first time, and a refresher for those who loved them from the start. 1. American G.I.’s were among the first to hear The Dave Clark Five, who got their start playing American military bases in the UK. 2. The Dave Clark Five made a record-breaking 18 appearances on “The Ed Sullivan Show,” with its weekly audience of 70 million viewers — more than any other rock, pop or R&B artist. 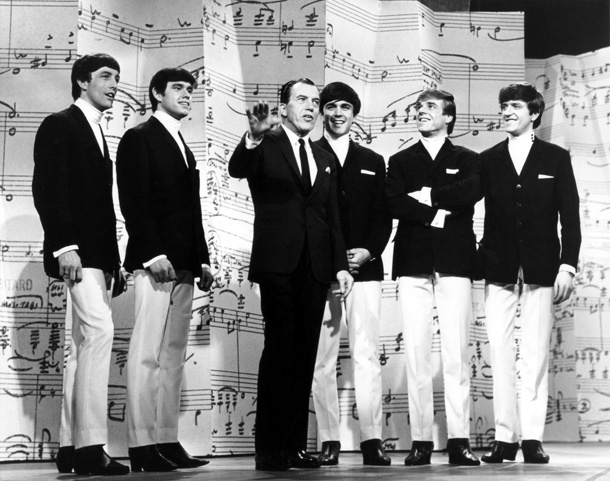 The Dave Clark Five with Ed Sullivan, of The Ed Sullivan Show. 3. Of all the British Invasion bands, The Dave Clark Five (DC5) were the first to tour the U.S. in the spring of 1964. The Dave Clark Five (DC5) airliner. About the fast trajectory of fame, lead singer Mike Smith said that the day before the band first appeared on the Ed Sullivan Show, he had never left England, never had been on a plane, never had stayed in a hotel and never had seen a limousine. 4. 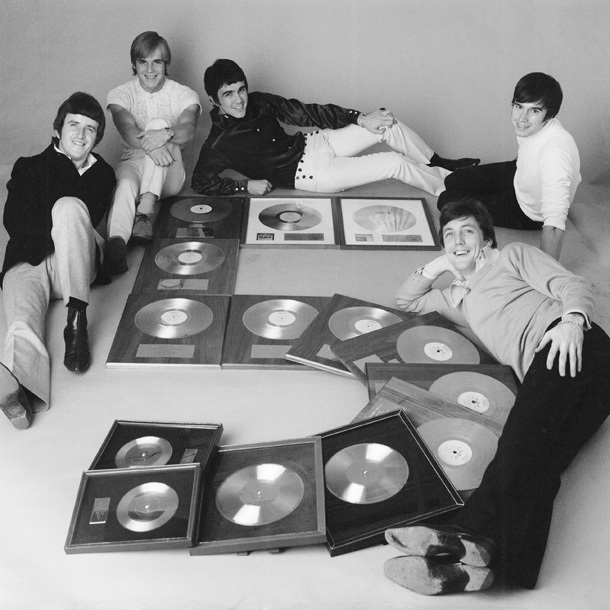 In eight years, The Dave Clark Five sold more than 100 million records and scored 15 consecutive Top 20 U.S. hit singles between forming in 1962 and disbanding in 1970. 5. 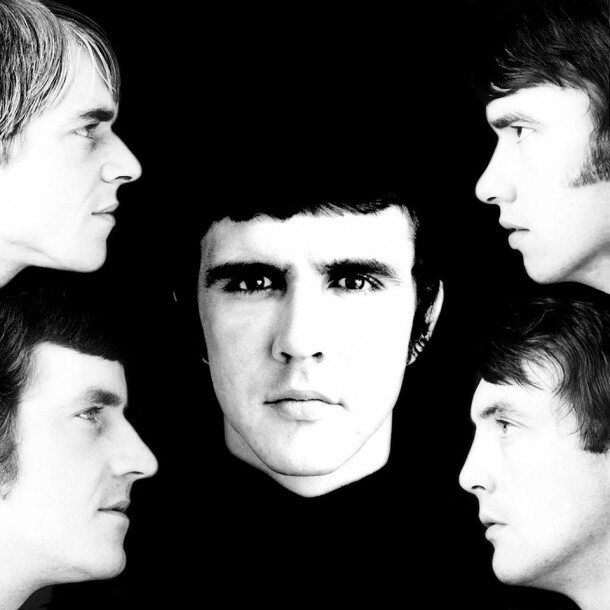 Unlike the Rolling Stones and the Beatles, The Dave Clark Five (Dave Clark, specifically) owned all rights to their music. Between 1975 and 1993, none of their music was available to be purchased in any commercial format. 6. 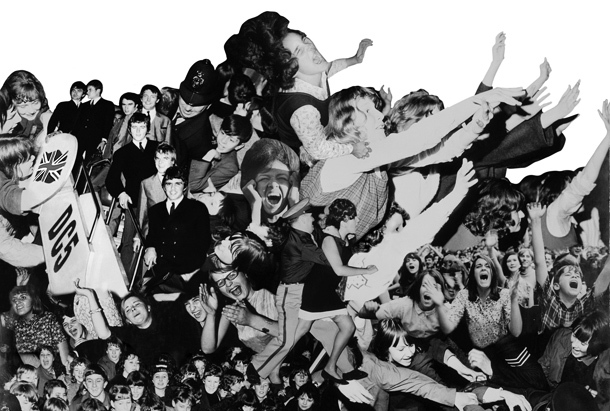 In 1965 Epic Records had a Dave Clark Five fan club with 500,000 members in 1965. It also had a fan club for Dave Clark’s dog, Spike. The Spike Clark Fan Club had over 50,000 fans. A hairstyle, the Dave Clark Spike, was named for the dog. 7. Before making it big with the band, Dave Clark was an extra and stuntman in films starring Elizabeth Taylor and Richard Burton (The VIPs) and Peters Sellars (Pink Panther: A Shot in the Dark). 8. 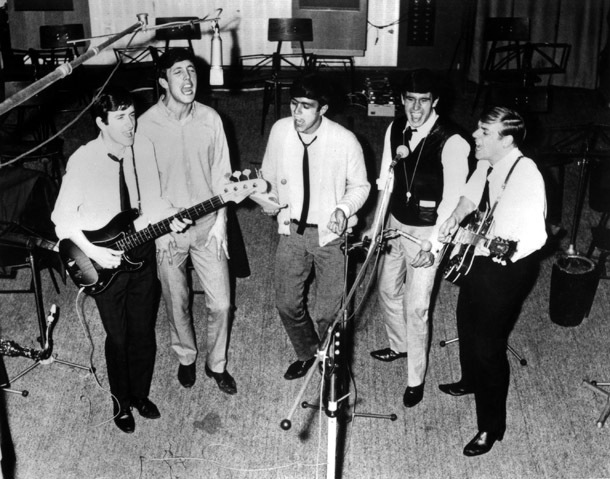 The Dave Clark Five’s “Tottenham Sound” references their London district (the Beatles were called the Mersey Sound for their Liverpool roots). Tottenham is eight miles north of Charing Cross in North London. 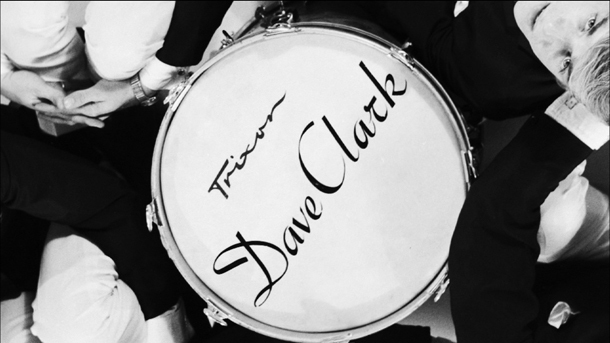 Still of Dave Clark Five Trixon drum from Dave Clark Five and Beyond – Glad All Over. 10. Dave Clark produced and co-wrote the musical Time that was seen by over one million people. 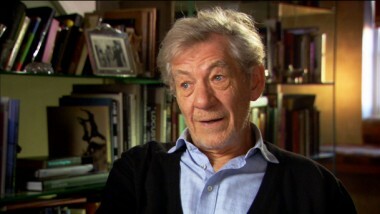 Clark produced the concept album with Laurence Olivier, Freddie Mercury, Julian Lennon, Dionne Warwick and Burt Bacharach, Stevie Wonder, and more. The album and its singles sold over 12 million records. 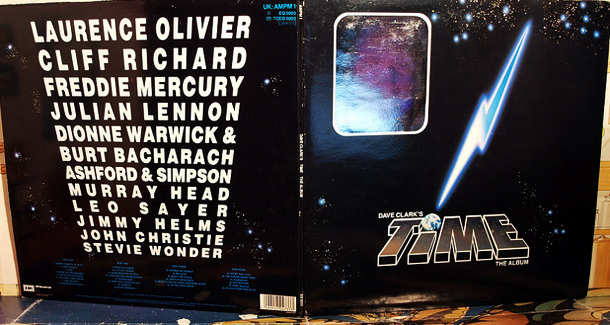 Time album produced by Dave Clark. Photo: Flickr/Steve. 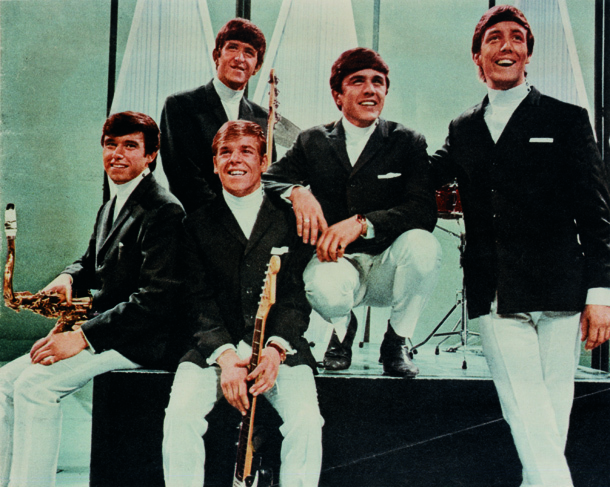 Learn more about the band and Dave Clark’s life beyond the band in The Dave Clark Five and Beyond — Glad All Over, premiering Tuesday, April 8, 2014.